Have you ever taken a moment to stop and notice your breath? If not, I invite you to pause now and see what you notice. Is your breath rapid and shallow or slow and deep? Does it stay in your throat or does it move into your chest and belly. Does your belly rise and fall as you breathe? Does your chest? Are you able to breath in through your nose or only your mouth? Does the breath flow into one or both of nostrils as you inhale? These are some of the questions I think about when I reflect on the breath. I only gained this awareness once I began practicing, and eventually learned how to teach yoga. I would hazard a guess that most of us are so busy on a regular basis that we rarely take time to think about or notice our breathing. If we are relatively healthy our bodies know how to keep us breathing so we don’t need to think about it. This is a gift. What if you took a moment to check-in with your breath when you were feeling anxious, stressed, or overwhelmed? What might you notice? I might notice that my throat feels tight and that my breathing is rapid and shallow. I call this throat breathing. What if I took a few moments to intentionally slow down and deepen my breathing, once I noticed this? I might notice my heart rate begin to drop, my neck and shoulders start to relax, and my worried/anxious thoughts might become less intense. This is the power of breath. This is also the first self-care strategy I like to reach for when there’s tension, stress, or anxiety in my body. Get Comfortable — Stand, sit, or lie down in a comfortable position. Close your eyes if you can or feel free to leave them open and find a point in the room on which to focus. Place one hand on your stomach over your belly button. Inhale slowly and deeply through your nose and let the belly rise. You want to feel your belly, not your chest, expand. Exhale slowly through your nose or mouth, breathing out all of the air. You want to feel your stomach contract and flatten. 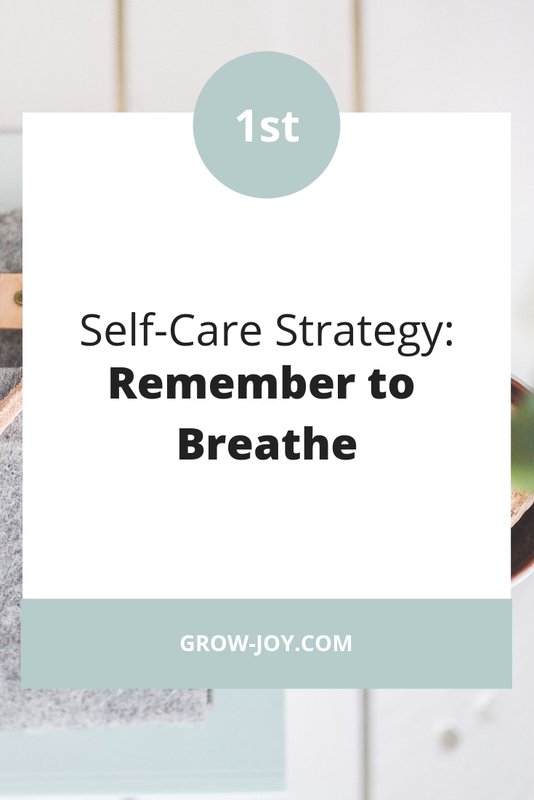 Continue to take slow deep breaths, in through your nose and out through your nose or mouth, for 30-60 seconds or until you feel your anxiety, stress, and tension levels decrease. You’ll know this is working if you notice a softening in the body and breath while your muscles start to loosen and relax. Our self-care begins when we take time to pay attention to and notice what is happening. We need to know what’s happening first before we can decide what steps we may want to take next. P.S. Did you enjoy this strategy? 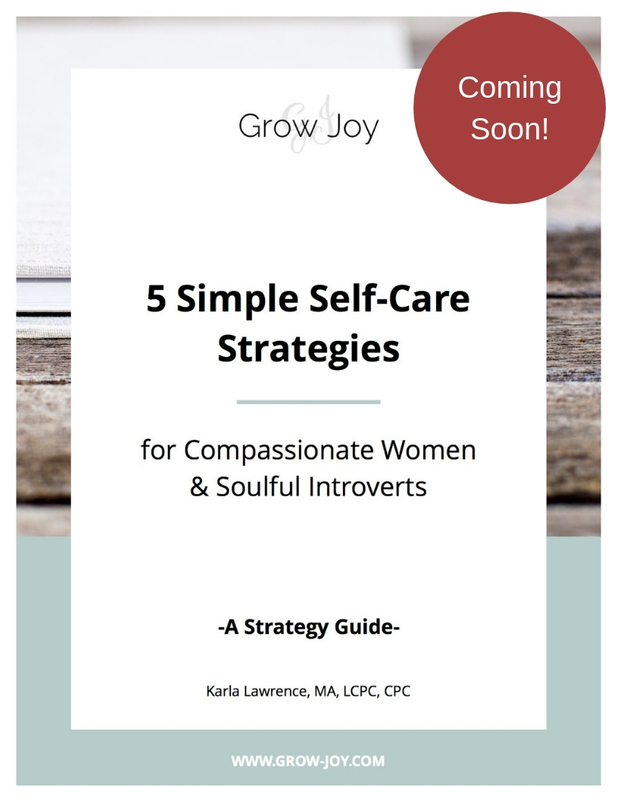 If so, I invite you back to the blog, as I’ll be sharing 4 more of my favorite simple self-care strategies over the next several weeks.